d)	soil is a natural resource and should be conserved. 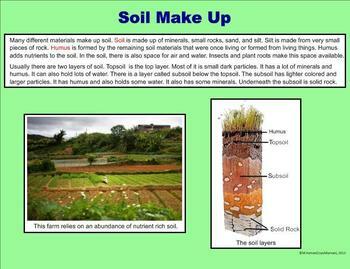 This lesson focuses on Soil. 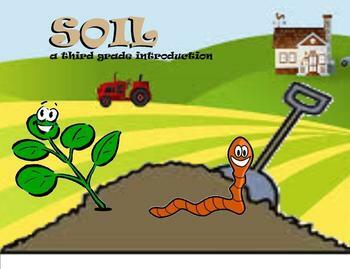 Included is The Importance of Soil, Understanding of Soil Layers (Humus, Topsoil, Subsoil, Rock), and Components/Soil Make-Up (Loam, Clay, Silt, Sand). Terminology is included, as well as a SmartBoard activity (Identifying soil layers and soil types.) The activity is also included in a PDF file and modified so it can be printed and issued as desk or homework assignments. The activity can also be a lead-up into a writing assignment as well.